Heidi was a robot at the annual event. Click here for more photos. How Well do you Know Project Runway Season 8? Click here for the 30-question quiz. Thanks Tony! And Toyouke sends us packing. ETA: It's been a long time since we've had a recap from Moi! I still think she's coming back. And how could we forget JordanBaker? Thank you dear recappers for making this cycle more fabulous and fun. We hope you come back for Season 9! Tim Gunn charmed an appreciative crowd at the King of Prussia Mall today with an assortment of new looks from Kate Spade, Juicy Couture and Lucky Brand. He also answered questions from the crowd - below are some of his responses. Tim was asked about how he felt about the winner of Season 8 of Project Runway. Tim was asked about his favorite designer from all of the years of Project Runway. The fashions were lovely and Tim exuded charm and wit. After the show people waited patiently in line for the opportunity to meet Tim and have a photo with him. If Tim comes to a venue near you GO! First of all, we want to thank all of our readers for your insightful comments these last couple of days. Yes there has been a lot of anger, but there has also been a significant amount of thoughtful analysis and reflection on the state of the Project Runway franchise. We plan to explore different elements of that over the next week and hope to make suggestions to the producers on how to make Project Runway better. But one comment that keeps coming up is some version of "I will never watch Project Runway again." At first we simply thought this was an immediate emotional outburst after the shocking finale decision. Now we're not so sure. We think some of you may be done. Time will heal some of this wound but we are curious, is this it for you and Project Runway? "It's Wrong What He Did." Anyone remember hearing Heidi say this line during the finale judging? I don't. 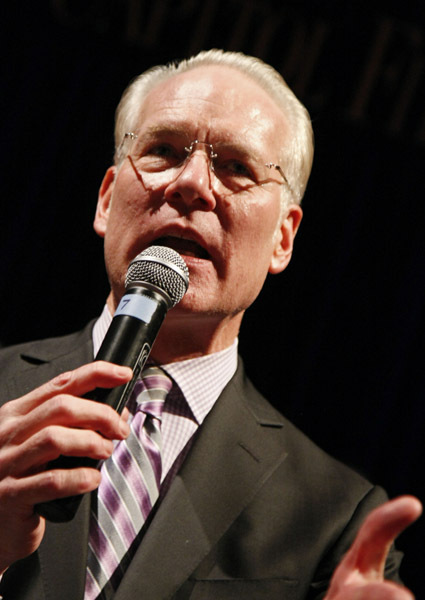 Tim Gunn will be at the King of Prussia Mall in Philadelphia today at 2:00. Click here for details. Click here for an interview with Gretchen Jones from Zap2it. A highlight: What do you think of Nina saying in a previous interview that you could be as successful post-"Runway" as previous winner Christian Siriano? Jones: I think that's an extreme compliment and true to how I'd feel about myself. I think you have to have tenacity to really compete in the fashion industry. Fashion in general is a competitive world and I believe that I have not only the potential to create seasons' worth of clothes with an interest, but I also think that they're clothes that women really want to wear. My goal is to dress women and make them feel beautiful. I think this is just that beginning of that being able to happen and it's just a matter of finding the resources in order to do that. Click here for a Q&A with Christian Siriano. Project Runway Season 8 Champion, Gretchen Jones talks about her experience on the show. Highlights: Gretchen is planning to move to New York. Her collection was made with sustainable fabrics. Gretchen was not surprised to win. Gretchen's runway music was by White Hinterland. Click here for Gretchen's website. 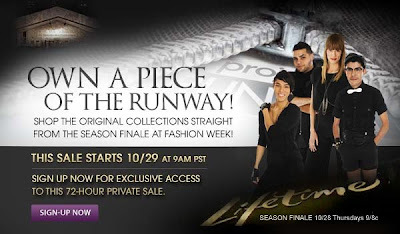 Click here for his private sale on SeenOn.com - you will need to register (it's free and easy) to see and buy the one-of-a-kind garments worn by celebrities such as Heidi Klum, Fergie and Rihanna, among others; don't wait of these unique items. Two of the 'Heidi' dresses are available in all sizes. The sale runs through the weekend. 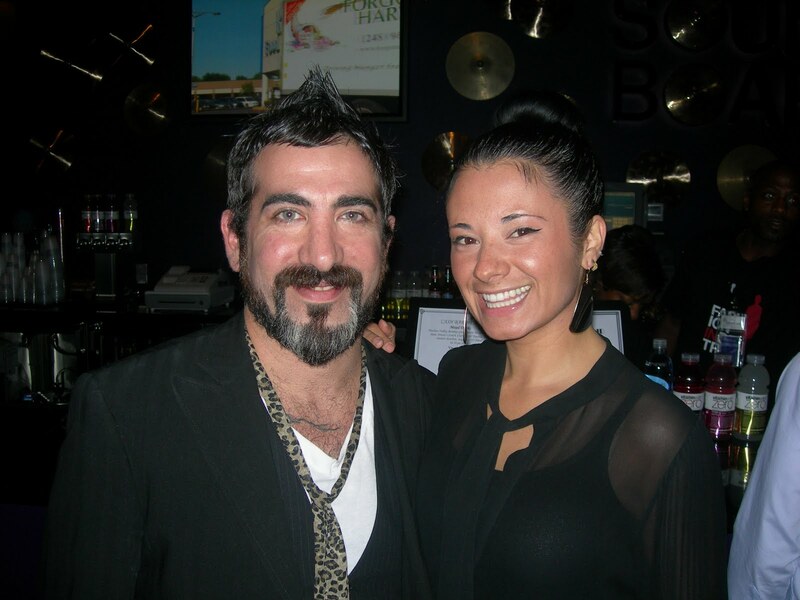 Project Runway season 8 finalist, Andy South talks to us about his experience on the show. Andy is staying in Hawaii for now and is already working on a new collection for production. He is also planning to do menswear. Andy's runway music is from Ketsana. Highlights include: Mondo traveled to NYC with his blankie and a Peewee Herman doll. These are among his most prized possessions - AND Tim Gunn has TWO Peewee Herman dolls! There are no plans for another reality show for Mondo. Mondo plans to move to Los Angeles. Yes, Mondo did observe that Nina Garcia and Michael Kors were disappointed that he "didn't listen" to them, but he was determined to create his own "dream collection" anyway. 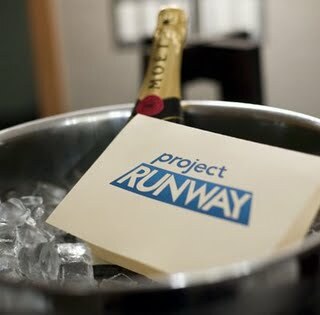 Thanks for another season of wonderful reporting on Project Runway! Love, love, love all of you!!! Were my eyes tricking me last night as we watched Mondo's looks on the runway? Thought I saw the outfit with the turquoise top first with a necklace, then without a necklace and then the necklace was back and then it was gone. How many times did they show the looks on the runway? Were they restyled in between takes? Mondo - you should have won! Hope you have a wonderful life ahead - you made us all so happy! There is so much to say about last night but let me get this in - Jessica Simpson was a pretty damn good guest judge. Usually when a celebrity/singer type is brought in they have very little of substance to contribute. Listen to her here, she still doesn't agree with the decision but is playing nice. I was highly cynical of her going in but her comments on the runway last night were spot on. Kudos to her for sticking up for her point of view. But in the end, she and Heidi never stood a chance against Nina and Michael Kors. The fashion elitists would have their way. The ultimate irony was how bad she looked in that Michael Kors dress. Jessica Simpson is a gorgeous woman and I love how she embraces her fuller figure. But Kors made her look sad. And when he and Nina went on to bully their way to a Gretchen victory it makes us all question who the real experts are. Photos: top row - Andy; middle row - Gretchen ; bottom row - Mondo. Photos courtesy of New York Magazine. Click to see a larger view. We have a winner! Season 8 of Project Runway comes to a dramatic close as it crowns a new champion in what can only be described as a major upset. Did you see this one coming? Go ahead, have at it. Post your reactions to the finale here. 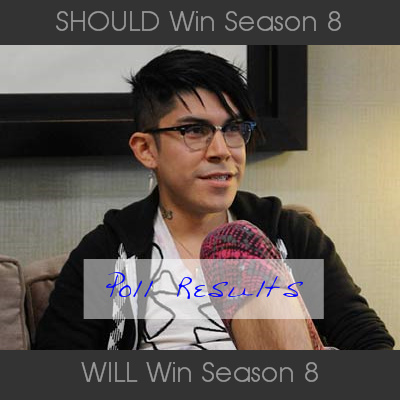 You felt that Mondo Guerra SHOULD win Season 8 of Project Runway and that he also WILL win. Click here to see how you voted. Check back with us tomorrow to cast your vote on the finale collections after seeing the garments on the runway tonight. Our friends at PopSugar send us this sneak peek of Jessica Simpson judging tonight's finale. In the end, Mondo ended up competing with himself. It was close, but Mondo's design from Episode 8 "A Rough Day on the Runway" is our reader's choice for the Top Look of Season 8. In what was probably the most perplexing challenge of the season, the nine remaining designers were asked to do their take on American sportswear using Jackie Kennedy as an inspiration. As an added twist, a piece of outerwear was required on Day 2 of the challenge. Everyone seemed to have a hard time figuring this one out (especially Tim Gunn), except for Mondo Guerra. Mondo made all the right decisions at Mood. Choosing a purple, black and white houndstooth tweed for the skirt, he matched it with a t-shirt that had black and white horizontal stripes. For the outerwear piece, he created a cool black jacket with purple lining. It was something of a signature look for Mondo and it finally earned him a much deserved first win. So let's tally up the damage. With three wins and six top finishes in 13 challenges, Mondo was never in serious danger of elimination at any point in Season 8. He becomes the second designer (along with Leanne Marchall in S5) to score three places in the BPR Top 5 Looks poll. Lovable, talented and wildly creative, he enters tonight's finale as the heavy favorite to take home the top prize. Is there anything that can stop the Mondo Express? Congratulations Mondo, you designed BPR's Top Look of Season 8! Tbone and suzq will be hosting our last play-by-play/party room for Season 8. 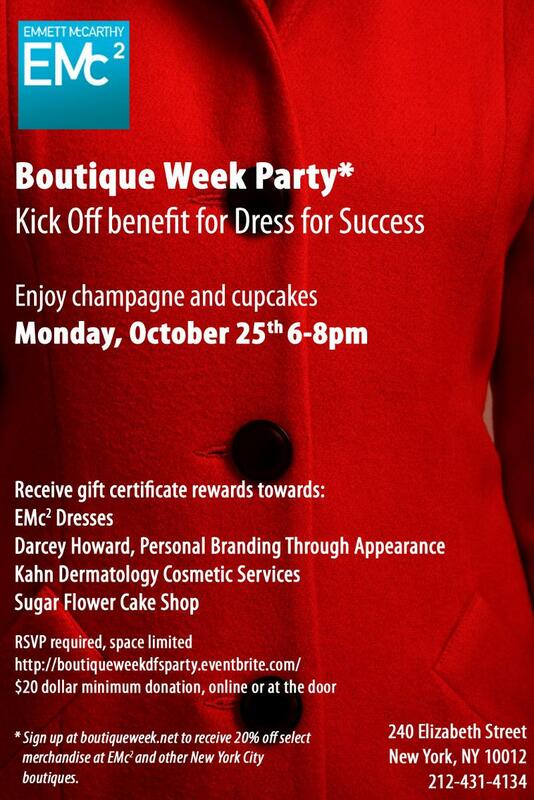 Join Project Runway fans from across the land as we watch the finale together. West coasters who want to be spoiled are welcome to join in on the fun as well. We go live at 8:30 p.m. ET. After the show, tell us what you thought about the finale and the judges decision in our reactions thread. The post is scheduled for 11:00 p.m. ET but if the winner is announced earlier in the show, we'll put it up then. This is where you can really let it rip! Andy, Gretchen or Mondo - who will it be? Join us tonight on BPR! Our poll is closed for Episode 13 of Project Runway Season 8. Over 4000 of you voted and you felt that Andy South, Michael Costello and Mondo Guerra should have advanced to the final 3. 70% of you felt that Gretchen should have been out. Click here to see how you voted. 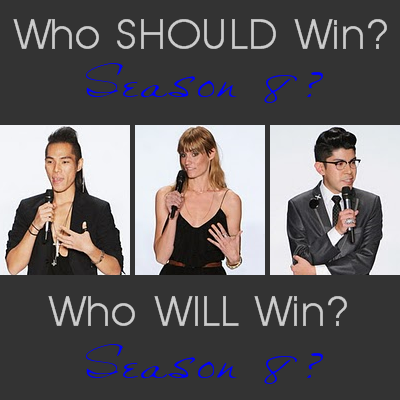 There is still time to tell us who SHOULD and WILL win Season 8. Click here. That poll will close prior to the opening of the Party Room tonight. And don't forget to vote for your favorite collection starting tomorrow morning. This is not an auction, it's s 72-hour sale. Click here to register. Project Runway Models on ANTM Tonight! Amanda Fields and Fatma Dabo will be appearing on "America's Next Top Model" tonight at 8:00 on The CW. There is still time to bid on the Challenge 13 auctions. Right now, this design by Michael Costello has the highest bid. Click here to see all of the items. There is also still time to vote in our "Who WILL and Who SHOULD Win?" polls. Sometimes the creative process takes us to places we never could imagine. Sometimes it reveals truths about the world in ways that cannot be spoken. And sometimes it can provide an avenue to reveal hidden truths about ourselves. For Mondo Guerra, creativity has been a sustaining life force. In Episode 10 "There's a Pattern Here", the seven remaining designers were presented with a repeat of S7's popular HP challenge, designing a pattern to be printed on fabric that would be incorporated into their design. As inspiration, the designers had childhood photographs and visits from their family members to evoke a profound moment from their lives. Mondo designed a cool black plus sign outlined in gold with magenta blocks in between. He used this pattern on a high waisted pant that was countered nicely with a black jacket and top. He scored his third consecutive solo win with this look ( a Project Runway first!) and solidified his growing dominance on the runway. But for Mondo, this was much more than just another beautiful garment. It was a way to tell with his family and the world about his HIV status. "I feel better now", he said after sharing the secret he held for so long, "I feel free". It was a moment that reached beyond the silly competition and touched our hearts. What a privilege it has been to get to know this amazing designer. Congratulations Mondo, that's two for you now in the BPR Top 5 Looks of Season 8! Tomorrow is finale day! Tune back in as we reveal your choice for the Top Look of Season 8! Alternative material challenges always seem to bring out the best in the designers every season of Project Runway. From the grocery store to the candy shop to the auto parts bin, these challenges have produced some of the most creative results on the runway. Andy South certainly proved that point again in Episode 3, "It's a Party". This early on in Season 8, we hardly knew who was who. Gretchen ran away with the first two wins and we weren't quite sure who else had the designing chops to go deep in the competition. The 14 remaining designers were tasked with creating a design using only party supplies from the fabulously tacky "Party Glitters" store. Andy spent the first half of his day trying to figure out what to do. He spray painted tulle and party favors and experimented with cellophane. He ultimately settled on using black ribbon as his primary source of material. He both folded and braided the ribbon into a paper crane design, creating a very sophisticated party dress that wowed the judges. This would become Andy's signature technique, eventually using it in his last fashion week challenge that won him a spot in final 3. Andy took home his first win with this dress, broke Gretchen's winning streak and established himself as a serious contender. Will he take home the big prize Thursday night? We'll have to wait for that but for now he has found a spot on the BPR Top 5 Looks of Season 8. Congratulations Andy! Marie Claire has a "Where are They Now?" feature in the November 2010 issue. Logan Neitzel, Carol Hannah Whitfield, Mychael Knight, Uli Herzner, Jay Nicolas Sario, and Chris March are each profiled. Click here for more. Christian Siriano and Payless will be expanding their collaboration. Click here for the press release. Nick Verreos reviews figure skating costumes for Universal Sports. Click here for more. Project Runway meets "The Arrangement"
Nick Verreos, Amanda Fields and Lisa Blades are all featured in tonight's episode of "The Arrangement." Team challenges have always been a recipe for major drama on Project Runway and perhaps no episode in the show's history exemplified that more than Episode 5, "There is an I in Team". In a unique twist on the tried and true concept, the remaining 12 designers were split into two teams of six and tasked with creating a 6-piece collection for Fall 2010. Casanova found himself on Team "Military and Lace". It had been a rough road for the lovable designer up to this point. On the bottom twice in the first four challenges, he had reached a point where he felt he couldn't do anything right. And when Tim Gunn visited him in the workroom and told him that his lace top looked "like the mother of all these other women", he reached his breaking point. "I'm on the verge to loose my mind", he wailed. There was no consoling him and it looked as if he might simply walk away from the competition. But in a classic "Make It Work" moment, Casanova rebounded and busted out a banging pair of white pants to go with his black lace top for a complete look that the judges swooned over. It was a moment of redemption for Casanova and a vindication of his talent after being repeatedly bruised and battered by Tim and the judges. Most people will remember this episode for Gretchen's epic runway meltdown or maybe even Tim's post-game designer takedown. But the true shining moment was Casanova rising from the ashes to turn adversity into something beautiful. These are the moments that make Project Runway something a little more special in the world of reality television and reminds us why we loved this show in the first place. So congratulations to Casanova for making the BPR Top 5 Looks of Season 8. Fantastico, Casanova! Spoiler note: If you click on the face of a designer below you will be immediately taken to images of their collection. The polls will close prior to the opening of the party room on Thursday, October 28th. Click here for a slideshow from Tim Gunn's recent appearance in Hawaii. 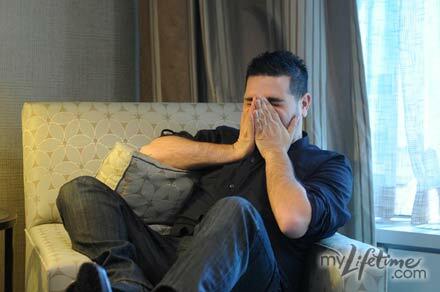 Click here for an interview with Tim from his appearance in Orlando. Click here for the slideshow. Tim will be in King of Prussia, Pennsylvania on October 30th. Tim will be in Troy, Michigan on November 6th. Tim Gunn is on Gossip Girl tonight! 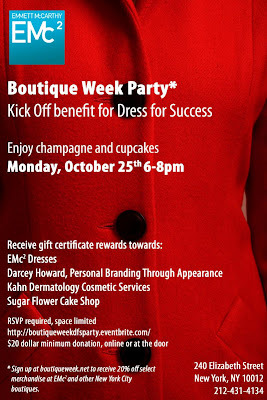 Enjoy champagne and cupcakes at Emmett McCarthy's Boutique tomorrow night at a benefit party for "Dress for Success." Project Runway Season 6 champion Irina Shabayeva has designed a line for Macy's INC. The collection will be available in February 2011. Click here for more information. Click here for fashion advice from Nina Garcia. Movieline runs down the "Finest Villians in Project Runway History." Do you agree with the choices? 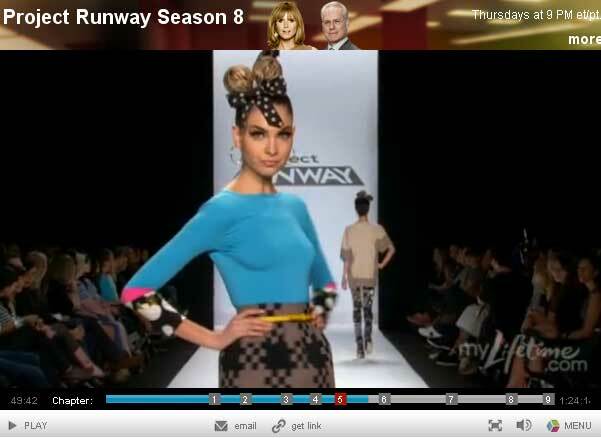 Our final preview video of Project Runway Season 8. They have been works of art, haven't they? Apparently, Michael Kors plans on sitting in his chair for a very, very long time. 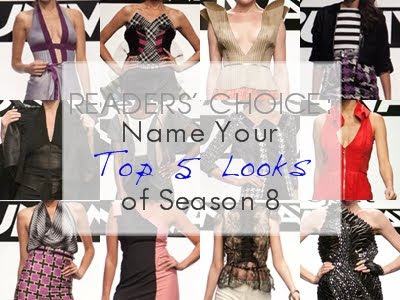 BPR begins its countdown to the finale by rolling out the reader's choices of the Top 5 Looks from Season 8. Making the cut at #5 is Mondo Guerra's couture design from Episode 9 "Race To the Finish". Every season Project Runway fans are burdened with the obligatory sponsor themed challenges. Often times the result is simply a boring extended commercial tackily added onto the show and less than stellar designs on the runway. In Epiosde 9, the eight remaining designers were tasked with creating a high fashion look to appear in a L'Oreal makeup "advertorial". Normally we would cringe at this type of product placement but after so many seasons, there is something comforting in seeing Collier Strong from L'Oreal in the workroom. Adding to the incentive for this challenge was an amazing cash prize of $20,000. The designers were asked to pick a makeup finish to use as the departure point for their design. Mondo Guerra, winner of the previous challenge, went first and immediately chose "Bright". In a season of designers who were very tentative on the use of color, Mondo has been the standout exception. Using the colors of a kaleidoscope as his inspiration, this challenge allowed for the "full tilt Mondo" to come out on the runway. He created a cool, modern hat and styled this look to perfection. His gown used alternating striped colors in a way that made Michael Kors liken it to "a Kentucky Derby horse ribbon exploded". The judges loved this look and so did you. This win came in the middle of a series of challenges where Mondo started steamrolling the competition. He took home the big cash prize with and now finds a place on the BPR Top 5 Looks of Season 8. Congratulations, Mondo! And of course there is Toyouke. Next up - the finale of the finale. Thank you recappers! Season 4, meet Season 8. Project Runway alumni Kevin Christiana and Valerie Mayen at the Fashion In Detroit Event today, hosted by Joe Faris from Season 5. Two of the nicest designers you will ever meet. Much more to come on this event later. I recorded a podcast with Michael Costello this morning, but had some trouble with the audio so I transcribed it for you. Michael was sweet and upbeat and had only nice things to say about his experience on Project Runway. Click here to see Michael's finale collection. There have been a lot of questions about whether or not there would be a reunion episode this season and it looks as if we have our answer. Next week's finale is scheduled to run two full hours (!) and from the looks of the preview snippet we saw last night, the reunion will be a part of that. The skinny we heard at Fashion Week was that they filmed the reunion before the finale runway show, so the designers did not know who the winner was. Either way, it should be entertaining. Look who is sitting next to Ivy! 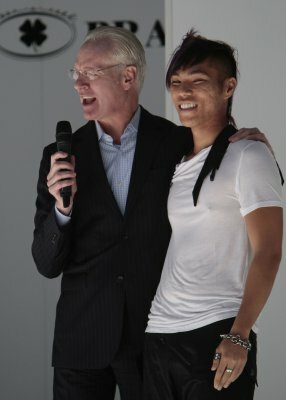 Photos courtesy of ProjectRunway.com. Click on picture for a larger view. You've seen the designs on the runway and now it's your turn to be the judges. This week you are Heidi Klum, Michael Kors and Nina Garcia. Look for our 'Who WILL Win?' and 'Who SHOULD Win?' Polls on Monday. 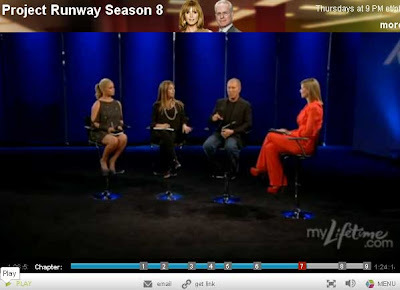 Project Runway brought Andy, Gretchen, Michael C. and Mondo into Fashion Week battling for a spot in the Season 8 finale. Along the way, Tim Gunn paid a visit to the final four at their homes. But in the end only three survived. What did you think? Post your reactions to Episode 13 here. Nick Verreos hosted "Project Style Trendsetter 2010" at the South Bay Galleria on Saturday. Click here for the full story. Nick will also be hosting a Project Ethos Fashion Show tomorrow night in Los Angeles. Project Runway Season 6 designer, Gordana Gehlhausen is among the designers showing collections at the event. Click here for more information. Tim Gunn was at the Corcoran Gallery of Art in Washington DC last night to celebrate the 5th anniversary of Capitol File. Click here for more. Click here for the Usmagazine.com survey, "Who Should Win Project Runway?" Tbone and suzq will once again be hosting our weekly play-by-play/party room beginning at 8:30 p.m. With 4 designers left and only 3 spots available in the finale, we think there will be an elimination tonight. All are welcome! After the show, let us know what you thought about the episode in our always lively reactions thread. Who will make the final 3? Watch together with us tonight on BPR. Our polls for Episode 12 are closed. You disagreed with the judges and felt that Mondo Guerra deserved the win this week. Click here to see the results. You also clashed with the judges and felt that Gretchen should have been out. Click here to see the results. 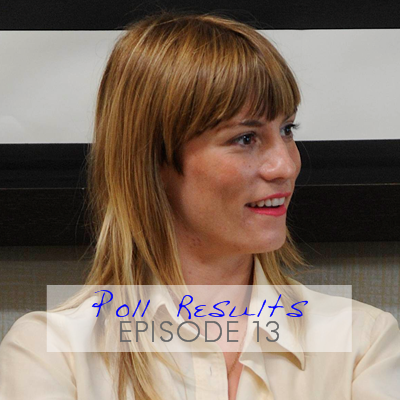 Check back with us tomorrow for our Episode 13 poll. There is still time to bid on the Challenge 12 auctions. Right now Mondo's design has the highest bid. Click here to see all of the items. There is also still time to vote in our episode 12 polls. Did you agree with the judges? Click here to vote. All proceeds from this auction benefit Crohn's & Colitis Foundation. The seller won the shirt several years ago in one of our contests. It is size small and has never been worn. A reminder to get your votes in for the Top 5 Looks of Season 8. Deadline is midnight on Friday. Click here to vote! Mondo Guerra showed a small collection at LA Fashion Week on October 15th. Click here for more information. Don't miss the mousetraps! Project Runway Season 6 designer, Shirin Askari is still in the running for the "Top Reality Star in Dallas." Click here to vote. Mila Hermanovsky will be at Stephens College in Columbia on October 22nd. Click here for more information. Project Runway Season 3 model, Amanda Fields returns with her "Model's Perspective" on episode 12. Thank you Amanda! This episode gave me goosebumps! I absolutely loved it from beginning to end. The moment when the five designers walked out to receive their fate from the judges, they embraced in a group hug that was genuine and touched my heart, as I am sure it touched yours. Episode 12 Online "We're in a New York State of Mind"
Click here to watch episode 12 online. April Johnston - "She's Madness"
Project Runway designer, April Johnston created this collection as a senior at SCAD. It's easy to see how the talented young designer was cast on season 8. 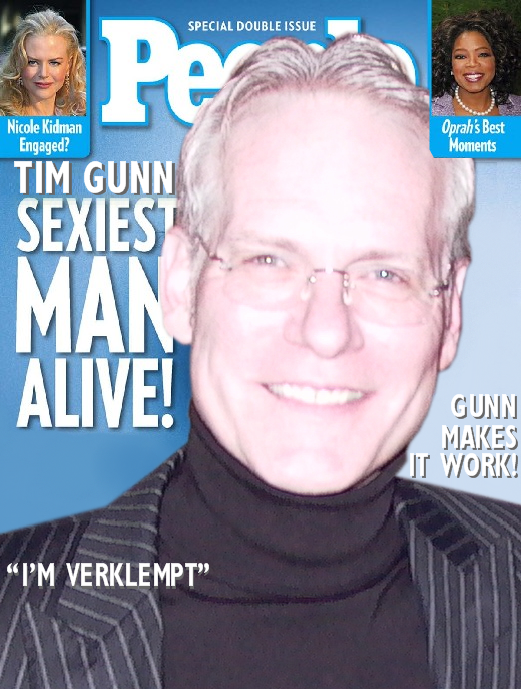 Click here to see a clip of Tim Gunn on Gossip Girl. The episode airs on October 25th. Chris March Gets His own Show on Bravo!